One of my favorite weddings from 2013 was Megan and Johnnie’s ceremony at the Sheraton Eatontown Hotel in Eatontown, New Jersey. Megan and Johnnie met while working in a play together and throughout their romance they were surrounded by their theater friends, who actually assumed that Johnnie and Megan were married before the two had started dating… in fact, it could be said that’s why they decided to go out! 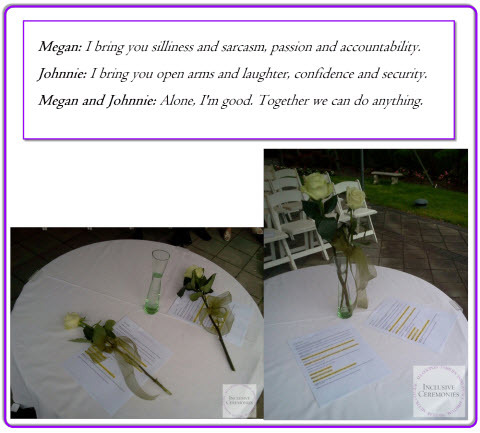 Megan and Johnnie exchanged roses and spoke about what they each bring to marriage. It’s rare to have so many long wedding readings in a single ceremony, but hearing Megan and Johnnie’s friends was an amazing experience! Linda, Lauren, Ernie, and Scott gave some of the most lively and heartfelt readings I’ve heard. I always say the ceremony is a success if the groom cries. In the end, there wasn’t a dry eye in the place. It was an amazing day, one of my favorite’s for sure, and I have to thank Jennifer and Laura at Pretty Little Details for making sure everything ran smoothly and photographers Mary and Roy of MaryandRoy.com for one of my favorite wedding pictures ever! You can see more of Megan and Johnnie’s wedding on Mary and Roy’s blog! Here’s what Megan had to say about the ceremony. 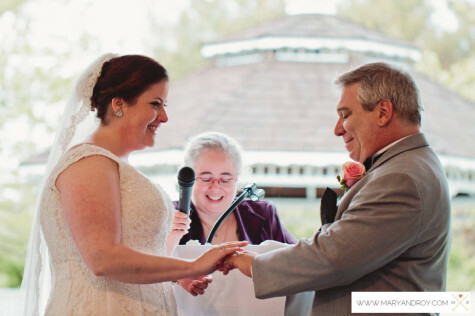 Cristina has an ability to hear what you want and make your dream ceremony come true. Her warm disposition, sincerity and genuine love for her work shine through in your personalized wedding ceremony. Cristina allowed my most special moment to be intimate and magical while managing to include a venue full of people. When I look back on my ceremony I am overcome with joy because no one could have told my love story in such a perfect way. My guests said it best “best ceremony ever”. There are not enough words in the world to thank Cristina for making my lovely love story everything I wanted and more. Megan and Johnnie’s readers were amazing. Here’s how you can help your readers be amazing too! Choose readers who are comfortable reading and speaking in front of people. 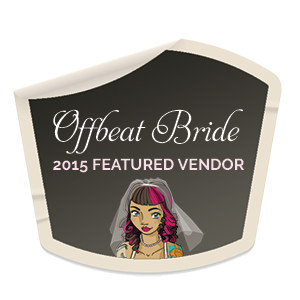 You don’t want them to remember your wedding ceremony as an uncomfortable experience. If you want to include someone who isn’t comfortable reading, there are other ways you can do it. Give your readers a chance to rehearse. Let your readers know in advance what they will be reading and give them a copy so you know they are practicing with the same version you have in mind. Don’t ask them to memorize. Readers can get emotional, they are so happy for you after all. So don’t expect them to memorize the reading. Have a copy, printed in a large font, waiting for them at the ceremony. This way they don’t have to worry about forgetting it and you know they will be reading the version you picked. Keep it light. Let your readers know that getting emotional is okay. 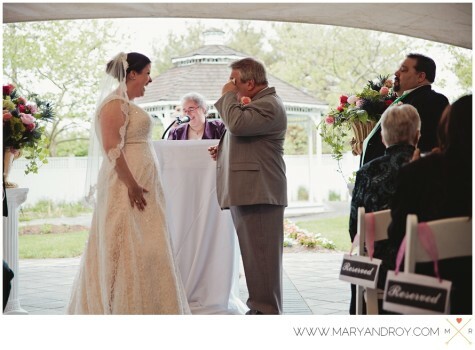 There’s nothing wrong with crying at a wedding. They can just take a deep breath and keep going. Are you trying to figure out how to include several readings or several loved ones in your wedding ceremony? I can show you how. 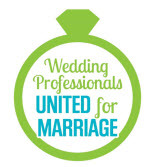 Contact me today about your wedding ceremony. 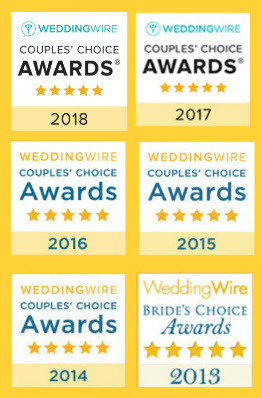 Want ceremony tips sent right to your inbox? Subscribe to the newsletter!